The Ark Storm is coming—a catastrophic weather event that will unleash massive floods and wreak more damage on California than the feared “Big One.” One man wants to profit from it. Another wants to harness it to wage jihad on American soil. One woman stands in their way: Dr. Gwen Boudain, a brave and brilliant meteorologist. When Boudain notices that her climate readings are off the charts, she turns to Gabriel Messenger for research funding. Messenger’s company is working on a program that ionizes water molecules to bring rain on command. Meanwhile, Wall Street suits notice that someone is placing six-month bets on the prospect of an utter apocalypse and begin to investigate. Standing in the shadows is journalist Dan Jacobsen, a former Navy SEAL. War hardened, cynical, and handsome, Jacobsen is a man with his own hidden agenda. 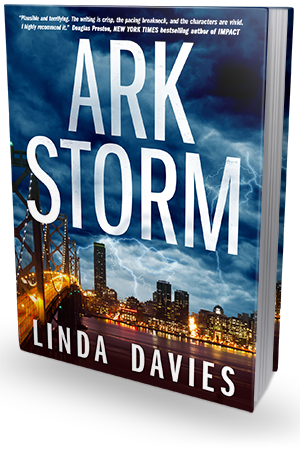 Linda Davies's Ark Storm brings together the worlds of finance, scientific innovation, and terrorism in a fast-paced thrill ride that will leave readers gasping. 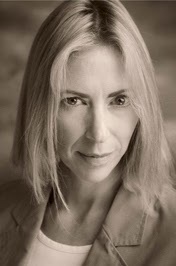 LINDA DAVIES is a graduate in Politics, Philosophy, and Economics from Oxford University, and worked for seven years as an investment banker before escaping to write novels. Davies is married with three children. She lives by the sea in Suffolk, United Kingdom. We have one hardcover copy up for grabs.